Amber glass bottle with Euro dropper. Tamper proof safety seal. Shrink wrapped. Helichrysum flowering tops are collected to make the essential oil by the steam distillation process. It is commonly known as Immortelle because the flowers are long lasting and do not wither easily. It has silver-green scented leaves and dark yellow flowers. The younger plants yield greater qualities of essential oil. Helichrysum petals were used in Europe as strewing herbs in the past. The oil is pale and transparent. Its viscosity is watery. Its honey-like scent makes it attractive to perfume industries. About 500 species of helichrysum exist, but only a few produce essential oil. Similar to wine, the same species of Helichrysum can yield different chemical constituents and scent. This depends upon the area of the world it is produced and if the plants grown are seaside or mountaineous region. Helichrysum essential oil relieves stress and restores the spirit. This essential oil is perfect for meditation use as it allows the breathing passages to open and reach a deep potential. 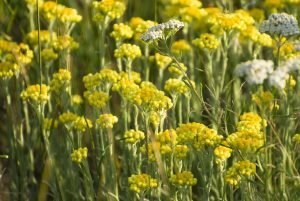 Emotionally, inhalation of helichrysum essential oil helps relieve stress and feelings of hopelessness. Helichrysum is used by energy workers to massage the muscles, as it calms nerves and relieves stress. Helichrysum oil helps promote creativity and fosters forgiveness. See our references at the bottom of this page for additional information. Helichrysum supports healing of mind-body pain, helps transformation, determination, hope and courage. Helpful to those who are wounded, traumatized, in turmoil or anguish. If using Helichrysum for emotional wellness, try using it with our free EFT Tapping scripts for Pain and Open Heart which help release these emotional issues. Helichrysum essential oil pairs especially well with bergamot, German chamomile, Roman chamomile, clary sage, clove bud, cypress, geranium, grapefruit, lavender, Lemon, lime, tea tree, neroli, orange, oregano, rosemary, tangerine, vetiver, ylang ylang. For use in clearing acne, eczema and other skin problems, gently massage the oil onto the skin before going to bed. Dilute with with a carrier oil. When mixed with lotions, it is used to maintain a natural skin color and improve skin texture. Applying diluted helichrysum essential oil over a period of time fades scars. Place drops of the oil on the palms, rub the palms together and inhale. It helps lift the spirit. May cause skin irritation in undiluted doses. For external use only. See our Safety Information page for further details when using essential oils.